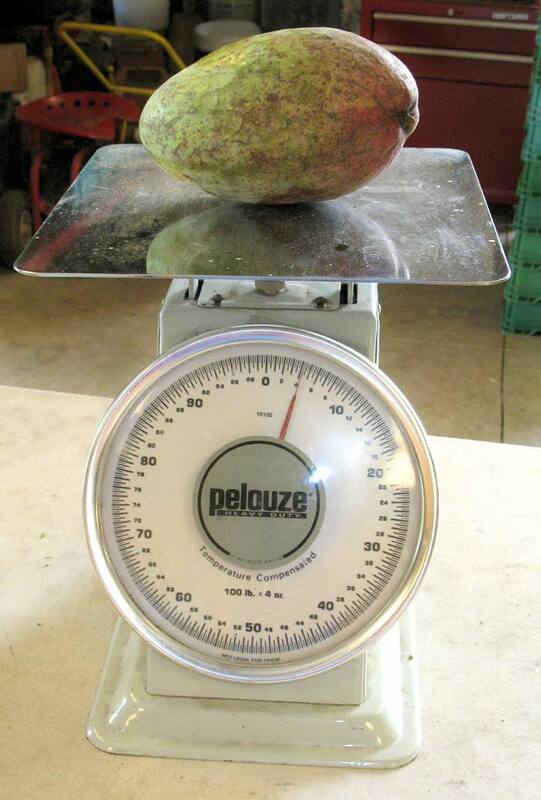 Ginormous mango — look closely at the scale to see how much it weighs. Nothing says summer in Miami like eating one or two (or three) mangoes a day. And with massive quantities of mangoes available everywhere, that’s easy to do. Home grown or roadside mangoes just don’t compare to half ripe, faintly flavored fruit coming in from Mexico. Just do yourself a favor and don’t even look at those when you are surrounded by local abundance. Bet you can’t eat but one of these monstrous mangoes! It came from Possum Trot Tropical Fruit Nursery, where Robert Barnum must be feeding it some amazing compost to grow that big. Can its extreme size be attributed to global warming? Look closely at the dial on the scale. It weighs over four pounds! Bet you can’t eat two!